Now there is no need to travel across country in search of exclusive designer wear when you can hop over to 7 Arches in Salt Lake. 7 Arches is a multi-designer store, located on the ground floor of a four-storied bungalow in Salt Lake, only 200 meters away from City Centre 1 Mall. Your heart will skip a beat or two as you walk into the store. Done up in vintage Victorian style, with pastel walls, Indian intricate motifs and interesting antique props all around, the store’s interiors will charm the socks off you! Sprawled across 4000 square feet of area, the store has been conceptualised by Basant Jalan and has been designed by renowned architect Vinoo Chadha. Why ‘7 Arches’, you ask? Well, it represents the seven arch shaped pillars that support the structure. This fashion and lifestyle den offers an impressive lineup of designer labels for all your apparel, accessories and home decor needs. Sample this: collections from renowned designers across India like Harsh Harsh, Nikasha, Anoli Shah, Nitin Bal Chauhan, Lajjoo C, Purvi Doshi, Anna Simona, Maspar and many others are on display to provide you with a luxurious shopping extravaganza. The ground floor has another section dedicated to the house proud with home enhancement products ranging from funky cushions to elaborate bedspreads, lamps and knick-knacks. If you believe in the maxim that ‘there is no such thing as too many pairs of shoes’, then be prepared to go broke buying amazing looking footwear by brands such as Stoffa and Crimzon. The store’s latest collection is a big win-win for the shaadi season this summer. If you are a bride-to-be, Seven Arches has the perfect blend of fashion and functionality for your bridal trousseau needs. 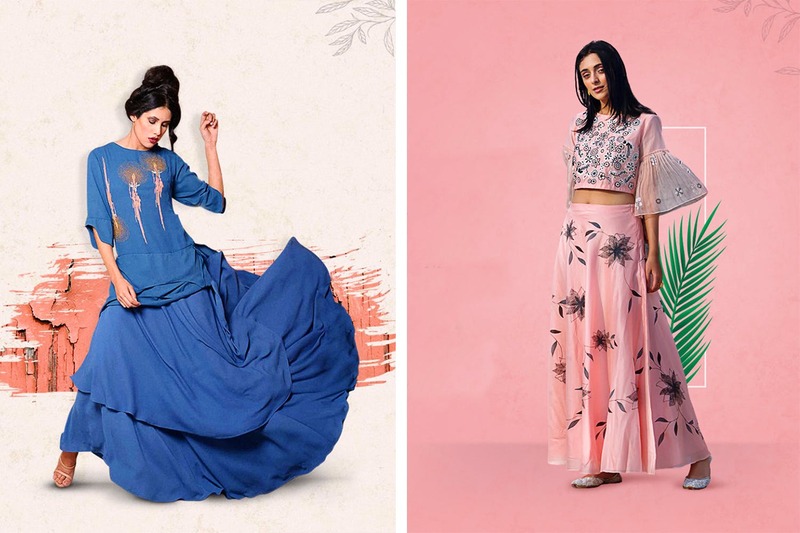 We love the fresh colours, floral details and uber stylish line of ethnic designs by Nikasha. You must also check out The Rug Republic’s trendy, chic and organic carpets to jazz up your casa.